A Grossmont runner returns to first on a pickoff attempt Saturday against Palomar. SAN MARCOS (2-28-16) — When AARON CROSS struck out Kyle McKean to end the game on Saturday (Feb. 27) and secure an 8-6 come-from-behind victory over 16th ranked Palomar, the 20th ranked Griffins snapped an eight game losing streak to Palomar overall and got the first win in San Marcos since the 2011 season. Cross (Mater Dei, Santa Ana) finished the final inning and two-thirds to pick up the win. Over the course of the four outs that he recorded, he allowed only two baserunners (a hit and a walk), while striking out one. Offensively, the Griffins (7-5, 1-0 PCAC) racked up 13 hits and were led by TANNER PERRY (Steele Canyon) who had three hits. While the five, six and seven hitters (TRAVOR BEARD (San Clemente), JUSTIN MITCHELL (Granite Hills) and ANDRES RIOS (Mater Dei, San Diego)) each collected two hits and combined for two runs scored and six runs batted in. Perry’s first hit left the new ballpark on the Palomar (5-8, 0-1 PCAC) campus to give the Griffins the lead from the jump. 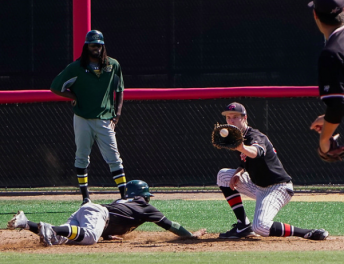 A Grossmont runner returns to first, as Palomar mishandles the attempt on Saturday in San Marcos. Mitchell got his first hit, a triple to right field, to get the ball rolling again. Rios followed that up with a single up the middle allowing Mitchell to score and a 2-0 Griffin lead. 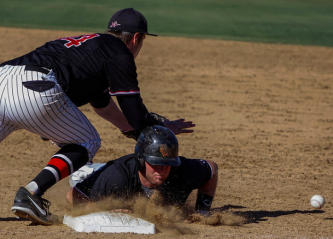 Palomar, who has had an up and down home season, broke the game open in the fourth inning when they scored five runs with two outs to take a 5-2 lead. In the seventh the Griffins regained their composure and started the comeback. Beard singled to right field. A couple of pitches later, Mitchell singled to left to put runners on first and second with no outs. After a strikeout, CURRAN FACER (El Capitan) got his lone hit, a double, down the left field line to plate Beard and wrap Mitchell over to third. After a Palomar pitching change, the Griffins struck out and then grounded out to end the inning down 5-3. In the eighth, Perry walked and that was followed by a NOAH STROHL (La Jolla) single to center field for two runners on with no outs. JUSTEN BURKEY (San Pasqual) laid down a bunt for a base hit to load the bases with no outs. Palomar changed pitchers again, but it didn’t do much good, as the first batter, Beard drew a bases loaded walk for what may end up being the easiest RBI he will be credited with all season. Two batters later, Rios singled up the middle to drive in Burkey and CABOT VAN TIL (Patrick Henry) who had been used as a pinch runner for Strohl, and a 6-5 Griffin lead. In the bottom of the inning, the Comets laid down a squeeze bunt that turned into a base hit and tied the game up at six. The ninth inning started well for the Griffins as they saw ROBERT BOSTEAD (Granite Hills) walk and Perry singled to left to put runners on first and second with no outs. After a strike out and a lineout, Perry and Bostead were advanced via a balk. Beard singled up the middle to drive in both runners and give Grossmont an 8-6 lead. Grossmont will put their perfect Pacific Coast Athletic Conference record on the line when Southwestern (4-7, 1-0 PCAC) comes to Noel Mickelsen Field on Tuesday (Mar. 1) at 2:00 p.m. Southwestern escaped the Desert with an 11-9 victory at Imperial Valley on Saturday. Imperial Valley scored all nine of their runs in the final third of the game. Perry,Tanner homered to left field, RBI. Rios,Andres singled up the middle, RBI; Mitchell,Justin scored. Medina,Efrain doubled to left center, RBI; Breault,Dylan advanced to third; Buck,Grant scored. Benson,Mike singled through the right side, RBI; Medina,Efrain advanced to third; Breault,Dylan scored. Norton,Cody doubled to left field, RBI; Benson,Mike advanced to third; Medina,Efrain scored. Charles,Eric singled to center field, 2 RBI; Norton,Cody scored; Benson,Mike scored. Facer,Curren doubled down the lf line, RBI; Mitchell,Justin advanced to third; Beard,Travor scored. Beard,Travor walked, RBI; Burkey,Justen advanced to second; til,Cabot Van advanced to third; Perry,Tanner scored. Rios,Andres singled up the middle, 2 RBI; Beard,Travor advanced to second; Burkey,Justen scored; til,Cabot Van scored. Medina,Efrain singled, bunt, RBI; Breault,Dylan advanced to second; Henderson,Casey scored. Beard,Travor singled up the middle, 2 RBI; Perry,Tanner scored; Bostedt,Robert scored.